Tips to Find the right Body Shop After an Accident? Did you just get into an accident? It happens to everyone. If your RV suffered any damage, it may require a trip to an auto body and paint shop. Only specialized auto body shops with the right experience will aim to restore the vehicle to its original condition. RVs are specialized, and in most cases customized, vehicles that should be properly maintained and regularly serviced by mechanics, who specialize in RVs, to keep them in tiptop shape. The same concept applies to RV body repair. Tip #1: Insurance Direct Repair Programs – Typically, insurance companies have a list of the trusted auto shops. Ask the shop if they have an arrangement with an insurance company or if they can accept car insurance. It is convenient to get the RV repaired at a pre-approved shop. If they do not offer the service, look for another shop, to make sure your claim goes smoothly. Tip #2: Original Equipment Manufacturer Certification (OEM) – Major RV companies such as Chrysler, Ford or Honda, produce spare parts and other companies install or distribute. The OEM certification is awarded to auto body shops that have met the specifications of the manufacturers. An Auto body and paint with OEM certificates should get the upper hand during your selection. Tip #3: On-Going Training and Re-Certification – Each year brings new technologies to the auto industry. To stay in touch with the changes, auto shops offer continued training for their technicians. Among the most recognized certifications include I-CAR (Inter-Industry Conference on Auto Repair) ASE and OEM. Tip #4: Right Tools for the Job – Auto shops try to get the fix right the first time. For this, they need the right equipment as well as the right skills. Some tools required for RV repair, include frame straightening equipment and three-dimensional frame measuring machine for bodywork. 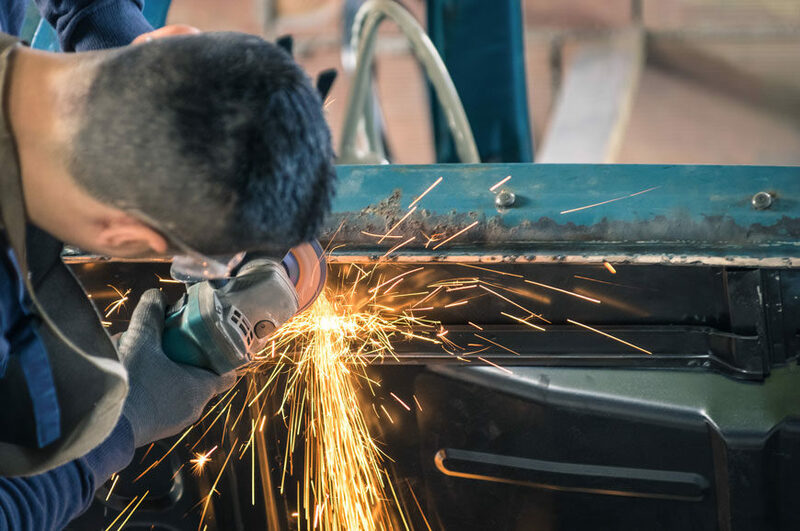 Another device is the squeeze-type resistance spot welder necessary for reproducing factory original welds and a large enough paint booth to fit your RV in it. If the shop lacks this equipment, various problems may exist. A wrong body frame repair may cause issues with the alignment, or wear the suspension. Furthermore, bad welds can cause rust contamination. Tip #5: If They Outsource the Work – RV repair jobs are taxing and specialized. A body shop can take your job despite lacking the people for the repair and machinery, only to outsource to a third party. Right away, this can result in unforeseen issues. For instance, increased expenses or bad repairs. Tip #6: Customer Reviews – Once you decide on the shop, you can also check out the experiences of other customers. Consider visiting their premises and speaking to the staff to make an informed decision. In summary, ensure the RV body shop has relevant certifications. Walk around their facilities and ask questions about the machinery. Determine if they have handled similar repairs jobs in the past. Lastly, read customer reviews online or ask around to build trust. World Auto Body has always been the #1 for all RV body repair because we meet the standards to deliver the results you expect. We have the certifications, equipment, experts and excellent customer reviews. Call Us today for a quotation. I really like your tip about checking out the experiences of other customers by reading customer reviews. I think that would be a good idea to find a good auto body shop. I recently got into a fender bender and I need to find a good shop to take it to. I will have to make sure I read reviews before taking my car in. My wife was recently in a car accident and we’ve been trying to recover from it the best that we can. I liked that you had mentioned that it can be important to make sure the company has all the right tools for the job. We’ll have to start looking for an auto body repair company in the area that can take care of our car, and we’ll be making sure they have all the proper tools. I totally agree with tip # 6 about checking customer reviews as one way to find the best auto body and paint shop for your needs. It is recommended that you do a little online research and see what former customers have to say about a particular auto paint shop. If you receive mostly positive remarks, then it’s probably a good idea to pay them a visit and see for yourself. If I were to look for auto paint services, I would make sure to take this into account. Thanks. I’ve been looking for a good collision repair service. I’m glad you talked about how you should see if the collision repair service outsources the work. I’m going to have to look for a good collision repair service and see what we can find! I like your advice on making sure that the auto body repair shop has the right tools for the job. I am looking to get my grandpa’s old RV fixed up and not all shops would have the equipment necessary for this. I will have to look around online and ask some shops if they can take care of my RV before the summer. Find your best options from our professionals. Questions You Should Ask Prior to Settling on an RV Body Shop? Learn About Quality Car Paint Job?